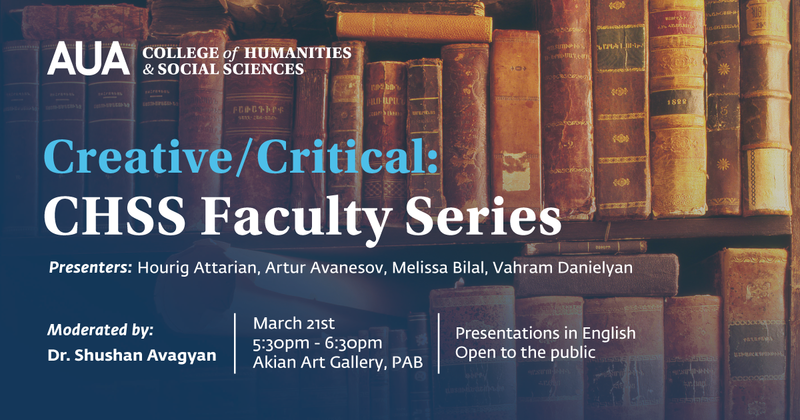 The Creative/Critical discussion series of the College of Humanities and Social Sciences, featuring the scholarly and creative output of CHSS faculty members, presents its second panel discussion. Through the varied lenses of Feminist Studies, literature, music, and oral history, panelists will explore interstices of convergence and confluence between cultures, bodies of knowledge, and methodologies. Hourig Attarian is Assistant Professor in the College of Humanities and Social Sciences at AUA. She is also a core member of the Centre for Oral History and Digital Storytelling (COHDS) at Concordia University in Montreal, Canada. Dr. Attarian received her PhD from the Faculty of Education, McGill University. Her work focuses on storying memory and identity through visual and narrative explorations. Melissa Bilal is an anthropologist, ethnomusicologist, and historian who has taught at the University of Chicago, Columbia University, and Bogazici University. Prior to coming to AUA, she was a visiting scholar at Massachusetts Institute of Technology where she co-launched the annual Feminist Armenian Studies Workshop Series. Vahram Danielyan received his PhD in Armenian Philology from Yerevan State University in 2009. Dr. Danielyan completed a post-doctoral fellowship at the University of Michigan, Ann Arbor in 2010-2011 and successfully completed the course of study at the Institute for World Literature at Harvard University in 2016. He teaches a course called “Armenian Language and Literature” at AUA. Artur Avanesov, composer and performer, studied piano and composition at Yerevan State Conservatory, completing his postgraduate studies in composition and musicology. He was a member of the Lucerne Festival Academy (2003-05) and of Ensemble Recherche in Freiburg, Germany in 2007. Dr. Avanesov has contributed to the foundation of the Swiss-based international contemporary music ensemble, Laboratorium. He is a lecturer at the American University of Armenia and at Yerevan State Conservatory.